Pingyao, officially Pingyao Ancient City, is a settlement in central Shanxi, China, famed for its importance in Chinese economic history and for its well-preserved Ming and Qing urban planning and architecture. Administratively, it comprises the town of Gutao in Pingyao County in Jinzhong Prefecture. It has a population of about 50,000. The town is first recorded c. 800 bc and has been the seat of local government since at least the Qin. By the 16th century, it was a regional financial hub; in the late 19th century, some consider it to have been the financial centre of the Qing Empire. It is a UNESCO World Heritage Site and a AAAAA-rated tourist attraction. There was already a settlement in place at Pingyao by the reign of the Xuan King (r. c. 827 – c. 782 bc), when the Zhou raised earthen ramparts around the site. In the Spring and Autumn period, the county belonged to the kingdom of Jin. It was part of the kingdom of Zhao in the Warring States period. Under the Qin, it was known as Pingtao. During the Han Dynasty, it was known as the seat of Zhongdu County. Pingyao serving as the financial center of the region from the 16th century and of the entire Qing Empire during the late 19th century. During those times, there were more than 20 financial institutions within the city, comprising more than half of total in the whole country. Rishengchang was the first and largest, controlling almost half of China's silver trade under the late Qing before going bankrupt in 1914 in the aftermath of the Xinhai Revolution. Organized restorations have been undertaken periodically since the 15th century, the most recent phase beginning in 1979. 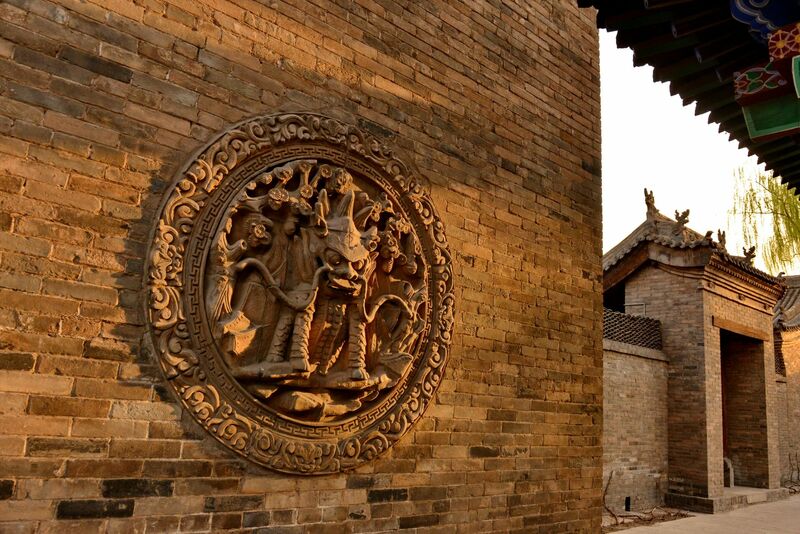 In 1986, the China designated Pingyao as one of the Chinese Historic and Cultural Cities. It became a World Heritage Site in 1997, including the outlying Zhenguo Temple and Shuanglin Temple. In 2004, part of the southern walls collapsed; they have since been reconstructed. Pingyao is located on the east bank of the Fen River near the southwestern edge of the Taiyuan Basin. It is approximately 100 km (62 mi) south of central Taiyuan and 715 km (444 mi) southwest of Beijing, the national capital. Pingyao County is adjacent to Qi County, whose seat is also a protected historic and cultural city. The climate of Pingyao is temperate. It’s cold in winter, often having northwestern winds with little snow and severe fog. In the spring, the temperature varies greatly between day and night, with a little rain and some winds. Summertime is often hot, humid and rainy. Autumn days have falling temperatures with little rain and are cool and clear with abundant sunshine. Pingyao still retains its urban layout from the Ming and Qing dynasties, conforming to a typical ba gua pattern. More than 300 sites in or near the city have ancient ruins. The city has over a hundred streets and lanes, lined with close to 4,000 17th–19th century shops and residences. The streets and storefronts still largely retain their historical appearance. The city walls of Pingyao were constructed in 1370, the 3rd year of the Hongwu Emperor of the Ming. They enclose an area of about 2.25 km2 (0.87 sq mi). The town is accessed by six barbican gates, one each on the north and south walls and two each on the east and west walls. This pattern is similar to that of a turtle (the head, tail and four legs), earning Pingyao the moniker "Turtle City." The walls measure about 12 m (39 ft) high, with a perimeter of 6,163 m (20,220 ft). A 4 m wide and 4 m (13 ft) deep moat can be found just outside the walls. Aside from the four structured towers at the four corners, there are also 72 watchtowers and more than 3,000 battlements. The number of defensive works supposedly represents the number of Confucius's disciples and other students. The walls are considered among the best-preserved ancient city walls on this scale. Increases in tourism have put pressure on Pingyao. During China's Golden Weeks, the number of visitors to the city has sometimes been as high as 2½ times its planned maximum capacity. During the single week around May Day in 2007, the town made about 94.5m RMB from visiting tourists. Since that high point in 2007, the government has reduced the number and length of China's "golden weeks", spreading domestic tourism more equitably throughout the year. The Global Heritage Fund has also worked with the Pingyao County People's Government to protect the town against overdevelopment and damage from its high volume of visitors. The stated goal for their Pingyao Cultural Heritage Development Program is improved preservation of local vernacular architecture and traditional arts through improved planning and increased conservation efforts.